I don't think long/short equity applies to the 90/60 fund. The Principal Risks listed in the prospectus doesn't list Short Sales Risk. So I don't believe that's the appropriate benchmark. Last edited by typical.investor on Thu Dec 06, 2018 9:27 am, edited 1 time in total. How do you backtest with leverage in PV? Read it again. It's clearly not the benchmark. What it is is a hypothetical portfolio with desirable characteristics offered by alternatives. So by using the leveraged 90/60 fund, you can have full access to core holdings (stocks and bonds) but by using less capital. Thus you will have money left over to hold alternatives which sometimes be a drag on returns (commodities for instance) without having to worry about the drag because you are fully invested. Interesting fund, but I will not be investing in this fund. It would violate my self imposed rule that risks are to be taken on the equity side of the asset allocation and 90% equity is too much for me (I would be unable to sleep well at night). Entering the futures markets on the bond side will increase risks. I must have made a custom series, but I've since deleted it. You can get an approximation by building a portfolio that is 90% stocks, 60% bonds and -50% cash. It’s a bug in the URL string the code invoked by that link is trying to execute. The fund is not really intended to be the only holding in a portfolio, so when used as designed you wouldn't necessarily have 90% equity exposure. For instance, since 2004 simple 60/40 portfolio (e.g. VBINX, Vanguard Balanced Index) had 60% equity exposure with annual returns of 6.89% and a maximum drawdown of 32.57%. Diversifying with 5% in gold (e.g. GLD, SPDR Gold Shares ETF) and 15% in international bonds (e.g. PFORX, PIMCO International Bond (USD-Hdg) ) would have reduced the drawdown to 27.45% and kept annual returns fairly steady at 6.88%. This portfolio had an equity exposure of 48%. Keeping the 5% gold and 15% international bonds but using NTSX instead of VBINX creates a much more efficient portfolio. You'd only need 66.7% in NTSX to get back to the 60% net equity exposure you started with, freeing up 18.3% of the portfolio to go back into bonds (e.g. VFITX, Vanguard Interm-Term Treasury). This portfolio had annual returns of 8.31%, with is about 20% higher than with the original portfolio, with less downside risk: maximum drawdown was just 25.77%. To recap, that's higher returns and lower risk with the same equity exposure. I evaluated investing in Treasury futures directly, since I don't really need a fund to do that for me. My conclusion is that buying Treasury futures provide most of the interest rate risk with only a small yield, with the yield curve as flat as it is right now. I don't think this fund should be owned by anyone. It's possible that there are at least some investors who have preferences and/or circumstances that differ from yours. I've also been evaluating direct investment in Treasury futures, and think that's at least a significantly better option than this fund. My conclusions are somewhat different, though - the carry on the short end of the curve is significant at the risk level it represents, and a flat yield curve makes a long/short "steepener" trade pretty attractive. Like, the 2-year treasury futures contract right now is yielding 30 basis points above the implied repo rate - that seems to me like a reasonable price to be paid to take on that amount of interest rate risk. This fund is not complicated and is potentially very useful to investors who want a portfolio a little more sophisticated than a straight market-cap weighted approach. In my opinion, and more importantly, in the opinion of Mr. Bogle and many others, "Simplicity is the Master Key to investment success." I reached a similar conclusion. I have a large position in 2 year treasuries, plus a steepener trade. I agree that the longer maturity treasuries look like a bad deal because the yield curve is so flat. The position has been a good one to have this year. I agree, but there are many investors with enough financial knowledge to consider a fund like this to the epitome of simplicity. Especially because it's not doing anything untoward with the treasury futures, by design. It's functionally doing the same trading practices as most index funds do to provide liquidity for redemptions by holding cash and e-mini S&P futures yet still being fully invested rather than have a cash drag. Mostly this is just the easiest way in Portfolio Visualizer to simulate a leveraged portfolio. It's roughly analogous to the way you'd lever in real life (e.g. borrowing at some rate in order to purchase securities on margin, or holding cash as collateral on a futures contract), but I make no promises about whether shorting cash (i.e. borrowing at the 30-day Tbill rate) is a good approximation of the cost of leverage for NTSX. My guess is that it overestimates the costs fo leverage, but I don't know for sure. Dropped 3.94% today (vs. 2.29% for TSM). That’s the kind of thing its owners are expecting? No, I was expecting it to lose about 0.63%. I think the point is that NTSX did NOT actually lose 3.94% on Friday. It was only down 0.63%. So at what rate at you borrowing? And how long do you have to pay? Yikes, only $18,000 of volume a day. Makes it tough to build up a real position! I own 52 shares in my Vanguard account (it's a free-trade ETF), valued today at just under $1300. Performance has been "meh" and I don't expect to purchase more. I may dump it when I hit one year. Honestly, doesn't seem to be performing as one would expect. With an inception in August 2018 and a terrible December 2018, a fund with 90% equity isn't going to look fantastic. Well that is very true. Time will tell. And two rates hikes since its inception. For a fund 60% in bonds, that’s not good either. Still, it’s done better than the S&P500. Honestly, doesn't seem to be performing as one would expect. WisdomTree’s approach applies 1.5x accounting leverage to a traditional 60/40 portfolio to create exposure equal to 90% equities, 60% bonds. The obvious "expectation" for this fund, then, is that it will be a 1.5X-magnified copy of a 60/40 fund, minus the cost of leverage. A convenient comparison is to the Vanguard Balanced Index Fund, VBIAX, which is equivalent to a continuously-rebalanced portfolio of 60% Total Stock, 40% Total Bond, and we can use a money market mutual fund to represent the risk-free rate for a short-term investment or loan. If I owned NTSX, my expectation or hope would be that if that it is doing its job, compared to VBIAX, it should have 1.5X the volatility as measured by standard deviation, and 1.5X the maximum drawdown. As for return, since leverage can't be a free lunch, we would expect NTSX to have the same Sharpe ratio as VBIAX. The cost of leverage should be equal to 0.5X the return of a risk-free (in the sense of volatility-free) investment, and a money market fund would be a reasonable example of a such an investment. Overall, the main picture is that overall, on a $10,000 investment, VBIAX made $51, NTSX lost $13, and the "riskless" VMMXX made $122. Our "expectation" is that NTSX = 1.5X VBIAX - 0.5X VMMXX. 1.5 x $51 - 0.5 x $122 = $76.5 - $61 = +$15.5. My personal judgement is, eh, it's all zero. But there was a shortfall relative to expectation, NTSX lost -$13 when it "should" have made +$15, so a $28 shortfall on a $10,000 investment over six months. The question is whether that pattern persists over meaningful periods of time and money. My expectation was a 1.5X magnification, and 1,609/992 = 1.6X, so, close. For standard deviation and Sharpe ratio, I will use PortfolioVisualizer, Source, and just treat the results uncritically. Standard deviation, NTSX 20.81%, VBIAX 15.32%, ratio 1.36X, expected 1.5X, so NTSX was less volatile than expected. Max drawdown, NTSX -11.24%, VBIAX -8.21%, ratio 1.37X, expected 1.5X, so, again, less drawdown than expected. Sharpe ratio, NTSX -0.52, VBIAX -0.57--expected equal, and this is a negative Sharpe ratio, so NTSX was better than expected. Notice that this is a different time range than the Morningstar chart, and shows a time period over which both funds had losses. In short... overall... you know, I hate leverage and clever-clever strategies and so forth, and six months is nothing at all, but so far I see nothing obvious to complain about in NTSX. It looks to me as if it is doing the job I would have expected it to do: 60/40, times 1.5, minus cost of leverage. Of course, as I understand it, the idea is not to use this fund by itself, but to use it as part of a big-deal capital-s Strategy. If you must have boring old 60/40, which you could buy from anybody, instead you should buy this special thing you can only get from WisdomTree... and then you can use less of it, thus freeing up portfolio space that you can now fill with other stuff you can buy from WisdomTree. The result is supposed to be overall portfolio that is an improvement on 60/40 by itself. The real question is whether that strategy is performing as expected, but I'm sure it's much too early to tell. How much of this is explained by the difference between 60% TSM + 40% TBM vs 60% S&P 500 + 40% intermediate treasuries before the leverage is applied? In the Asness, "Why Not 100% Equities," article from 1996, he states in the Modern Finance section that, "...an investor chooses a portfolio of risky assets (in this case stocks and bonds) to maximize the portfolio's Share ratio". He then goes on in the paper to suggest that leverage can then be applied to this optimal asset allocation (AA) to produce results that have a better return with comparable standard deviation (SD) than 100% equities. Then, in his conclusions, he states that, "Furthermore, this optimal mix of risky assets is the same for each investor." In other words, everyone should invest with the same asset allocation and then adjust risk up and down with leverage instead of adjusting risk by committing more allocation to stocks. All that said, wouldn't it be best to forego the use of this WT fund and create your own leveraged fund? There can be debate over which type of product is best for obtaining leverage, but let's assume leveraged ETFs for now due to ease of use. Instead of buying the WisdomTree fund, you could do a 30/70 (or something between that and 40/60) of either SSO/UST (2X) or UPRO/TYD (3X). The backtest below approximates what these funds would have done in the past compared to what the WisdomTree 90/60 would have done. The backtest uses VFINX for stock, VFITX for bonds, and CASHX to represent the borrowing cost for leverage. As the results show, the 2X 30/70 would have outpaced the WT fund by 0.5%/year with a lower SD and 1/2 the max DD. The 3X 30/70 would have greatly outpaced everything and would have still had less max DD than the WT fund. Nothing against WT, but maybe they should consider a WisdomTree 90/210 fund instead of 90/60? The origins of 60/40 as the "policy portfolio" gets more and more mysterious the more I've looked at it. You have to cherry-pick carefully to find any period of time over which 60/40 was the optimum. One theory that's been suggested in the forum is that, at the time when Harry Markowitz' work was becoming well known, 60/40 actually was the optimum over some data set that was easily available. (Note that "back to 1926" data you see everywhere is usually CRSP data, and the CRSP wasn't founded until 1960). 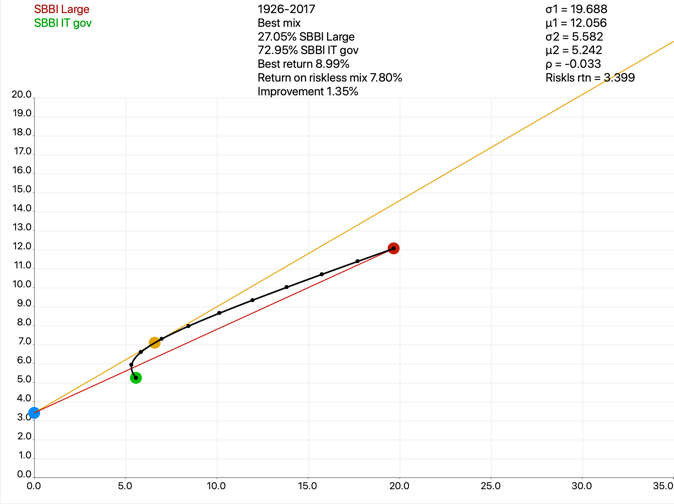 Another theory is that since many investors don't want leverage... or, possibly, that it wasn't allowed in the pension funds and other institutional investments that were trying to apply MPT... 30/70 had a higher Sharpe ratio but not enough return, and 60/40 was some kind of psychological compromise. Something in the general area of 20/80 or 30/70 not only has the highest Sharpe ratio, it is also about the ratio that would be dictated by "risk parity" if the only two assets were stocks and bonds. I don't really know if "risk parity" makes sense as an idea, and the phrase was apparently coined by Ray Dalio and includes not only the concepts of equal risk contributions, but also four specific asset classes, so "risk parity using only stocks and bonds" might not be an appropriate use of the phrase. Again, though, WisdomTree seems to be suggesting this fund, not as a plug-compatible replacement for 60/40, but as a building block they want to use for building specific strategies; that is, it's only intended as a component in some other strategy. Maybe 3x LETFs give you more bang for the buck, but no one is willing to really commit to them in size -- rational human fear. 60/40 simply isn’t the target for Wisdom Tree. Using 90/60 let’s you get 100% stock/bond exposure and have 33% left over for alternatives. 60/40/33 is what they use to make their case and probably performs better in a rising rate environment than 90/210 does. Depends on your alternatives of course. How could NTSX can return only 8.93% ? Isn't the math sp500*90% + GOVT*60% - Expense ratio? I was intending to increase my bond allocation. Now instead i am thinking replacing my existing US Large Cap allocation with this fund to achieve the same effect. Does it make sense? No, you have to account for the cost of leverage. It seems to me that this would effectively capture the term risk premium and equity risk premium while shorting cash if you believe the suggested model in this thread, which would not have been the right thing to do lately. It's not an inherently bad thing to do though. It's fine if you have enough conviction in the strategy to continue holding through a period of underperformance. The fund is low cost and well constructed for what it does. This fund has still only attracted 5 million dollars. That *seems* low, but I’ll admit that I don’t know what a reasonable expectation would be at this point. My guess would be that anyone who understands why this fund would be useful also understands how to do this themselves at an even lower cost and without much trouble. I’d like to know the answer to that. Well, let's deconstruct it a bit until the answer falls out. If we replace "interest rates (what interest rates?)" with "yield to maturity" for the underlying then we are now talking about something relevant. What causes yield to maturity to rise for an existing bond? Demand for the bond is now weaker, most likely because newer issues pay a higher coupon, so the price of the bond has fallen. I.e., no rational investor would pay more for a bond that is guaranteed to return less than another easily purchasable bond. The "cash" part tends to act as a buffer, taking some of the pain away from the falling price of the underlying bond. But we shorted cash, and are left with term risk exposure. So yes, if yield to maturity for the underlying bonds go up, you should expect to lose money. But I don't think you should regret it, because you purposely built your portfolio to expose you to term risk, and then the risk showed up. You are playing results, not strategy. That kind of thinking will drive you crazy, because you need to accept the risks you take. Agree with this, but the demand for NTSX hasn't been as strong maybe as they would have expected, and the demand for the product you just mentioned would be even lower I'd imagine. There would also be a bit of an issue with margin requirements with that much notional in bond futures, and you likely wouldn't have enough cash to consistently hit 90% exposure to equities (unless they also bought equity futures!). Having said that, I am hoping that the industry moves towards a direction where leverage isn't as scary as a concept and more ETFs offer retail investors an easy way to increase their sharpe ratio's while keeping expected returns the same. NTSX is a great step forward in that direction, but the demand to diversify away from equities just isnt there given returns in the last decade. I don't have interest much in NTSX as a "Balanced Fund", but I do find it a valuable option to add faux leverage in "better" balanced portfolios. For example, I was interested in NTSX as a component of an all-weather portfolio and found the right allocation so that my economic exposure was equivalent to an all-weather AA. If I did the math right, NTSX enables you to add leverage (1.2) to an all-weather portfolio in a non-margin account. Very cool! There's not much volume, so you'll pay a few cents to a HFT for the privilege of buying but it's negligible if you plan to hold. I paid about a $.03 per share premium based on its implied value. Fidelity has real-time implied value calculations in the detailed quote which makes it easy to set a limit order. I think that is why it is important to figure out, as retail investors, how to create these higher sharpe ratio portfolios on our own without having to rely on the fund companies to do it for us. Futures contracts are the ideal tool due to lack of volatility drag caused by daily rebalancing of leverage, but can be cost prohibitive. Fortunately, CME group is about to come out with the micro e-mini contracts, so the notional value of the equities are about to reduce by a factor of 10. If you pair 3 of the new /MES contracts (~$44k notional) with a /ZF 5 year note contract (~115k notional), you would would need about $53k in an account to get to the 90/210 portfolio (3x 30/70) mentioned in my previous post. If that's still too rich, you could use a variety of combinations of futures, leveraged ETFs, options, etc. to hit the target leverage.